Hi Sylvi! I love your dino card and that little dino is just supercute!!! Fab colouring too. fantastic card sylvie.i love the fun dinosaurs and your bold colours are great. Oh, I just adore this one Sylvie. SOOOO cute. This is such a great challenge - am still thinking about my entry for it though... Love the dotty background on your fun card! Gorgeous card. and cute image. Adorable card Sylvie, such a cute Dino, thanks for playing along at Passion for Promarkers. Love this dino image and plenty of pattern going on on this bright card. 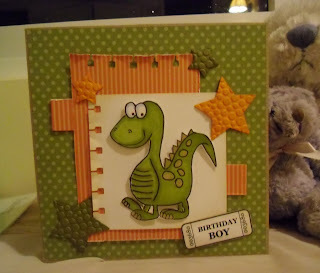 Hi Sylvie - this is such a fun card - love that cute dragon. Lots of lovely textures and patterns - perfect for our pattern challenge. I do hope you'll join us again next month! Oh Silvie, this is such a fabulous fun card. Thanks for joining us at St Lukes Charity Card Challenge this month. See you next month.